Topics: Newsroom, Career Center, Acadia Insurance | Closer Coverage, Financial Strength, and Management Team. agents.acadiainsurance.. Forgot Username? 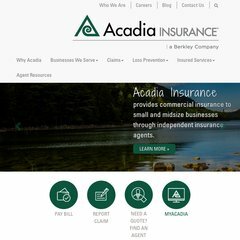 - Acadia Insurance - Insurance programs for small .. The site has about 129 users daily, viewing on average 3.70 pages each. It is hosted by Intermedia.net Inc (California, Sunnyvale,) using Apache/2 web server. The programming language environment is PHP/5.2.6-1+lenny13. It has 2 DNS records, ns28.worldnic.com, and ns27.worldnic.com. PING www. (64.78.0.185) 56(84) bytes of data. A ping to the server is timed at 44.5 ms.